The new, restyled, re-engineered Walther PPS M2 is a truly superb pistol, the most satisfying pistol in this class that I've ever spent time with. The older PPS had an accessory rail, a trigger guard magazine release (sometimes called a paddle release), and a replaceable-backstrap grip array. The rail is gone, so is the “paddle release,” and the grip design is greatly improved. There isn't one specific thing that makes the PPS M2 a standout, rather it is how well everything works together. For many mid-sized carry pistols, the first order of business all-too-often is finding a set of replacement grips or grip covers that fill out your hand better, or are just plain more comfortable. The PPS M2's factory grips are superb, as far as I'm concerned, filling out the hand nicely with subtle swells, offering very good control of the handgun, but not afflicted with the overly abrasive, sharp checkering styles that can rip up your tender flesh, sending you off in search of glue-on or replacement grips after your first shooting session. Walther claims that their PPS M2 trigger breaks at 6.1 pounds, and so it does. Break weight alone does not adequately describe how good this trigger is, or how it feels. It is a nice, short, progressive pull and it breaks crisply. There are lighter triggers out there, to be sure, for the recently tested Ruger LC9s Pro has close to a 5 pound trigger. Yet, the Walther trigger is head and shoulders above the Ruger trigger, for it has markedly less travel, it is smoother, and it is less surprising, in a good way. The Walther slide and barrel is “Tenifer” coated, a well-known trademarked process of salt bath ferritic nitrocarburizing essentially the same as various Melonite coatings used for scuff resistance and corrosion resistance. 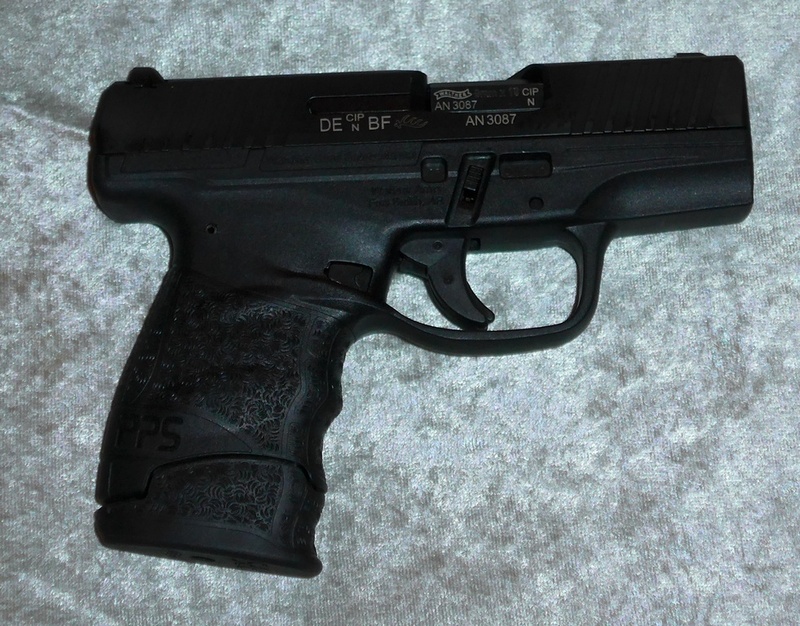 The slide of the Walther itself is very well machined, and has less side-to-side play and rattle than does my Glock 19, and the PPS M2 is far less rattley than the Ruger LC9. While closer tolerances like this do not always translate to better reliability (apologies to the AK-47), it is confidence-inspiring and satisfying nevertheless. The “Single-Stack Nine” is a popular platform these days, for good reason. It is hard to beat the ammunition choices, and recently even the F.B.I. has gone back to the 9mm Luger. Handguns are no different than anything else, for anyone and everyone has heard the sometimes heated (and pointless) debates about handgun brands, based only on what they choose to own. With a street price of something around $450, the Walther PPS M2 goes up against the Glock 43 and several other models, the Ruger LC9s selling for about seventy-five dollars less. No way would I possibly suggest that anyone focus on price alone when the subject matter is life-support equipment. Anyone who bothers to get training and practices a reasonable amount will quickly devour incremental price differences in ammo and range fees. You'll not be inclined to practice with a firearm that you don't find pleasant to shoot in the first place. 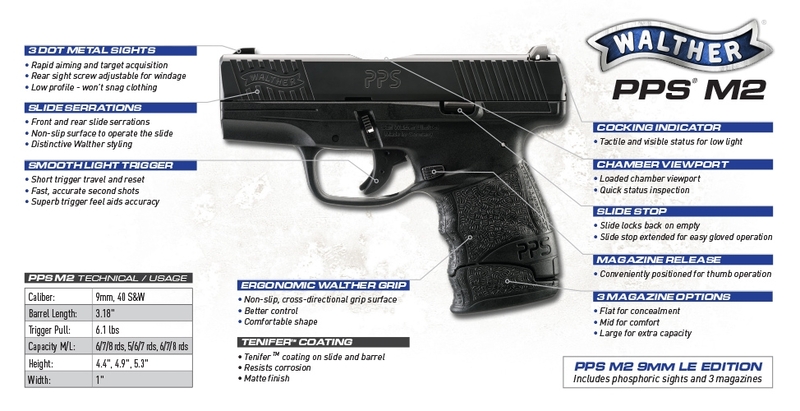 The PPS M2 is about a 1.32 pound handgun, unloaded, with a 3.18 inch barrel. It shaves half a pound of weight compared from my old, steel Makarov .380. The Walther not only guaranteed for life, but has a 48 hour service turnaround as well. Walther does seem to discourage the use of “+P” ammo in this handgun, as written in the manual. With the PPS2 M2, there isn't much room for improvement. Perhaps replacing the standard white dot front sight with an XS Sights replacement would be my only change. The Walther PPS M2 is easily my favorite in this class of single stack 9mm pistol. It was quite satisfying when shooting it in Las Vegas; now that I've had the time to spent more time with it here, I appreciate it even more. If the trigger doesn't win you over immediately, the overall build quality, the superb feel of the grips, and the easy take-down surely will. While not at all a large or "service size" handgun, it feels as though it is and is remarkably comfortable to shoot. Right now, the Walther PPS M2 gets my vote as the best new pistol of 2016. Once you take one for a test drive, you'll know why.